On January 27th, 2009, the Lisa Lopes Foundation (LLF) held a “VIP” album release party for “Eye Legacy,” the first U.S. solo album for the late Lisa "Left Eye" Lopes of TLC. The event was held in Atlanta at Ten Pin Alley, an upscale venue. The venue capacity was 500, which was easily maxed out by the many celebrities and guests in attendance, along with the excellent media coverage. Special performances included Reigndrop (Left Eye’s Lil’ Sister), performing “Neva Will Eye Eva” from the Eye Legacy album and Collizion of MTV’s America’s Best Dance Crew. The highlight of the night was the release of Left Eye’s album titled “Eye Legacy” which includes previously unheard tracks, along with collaborations with Missy Elliot, T-Boz, Chili, Bobby Valentino, Lil’ Mama and Free (former Host of BET’s 106 & Park). During the event, the Lisa Lopes Foundation presented its new program, the Edutainment Movement, which is education through entertainment. There was also an auction held and hosted by Ronnie Devoe (New Edition), in which sports and entertainment memorabilia was sold to benefit the Lisa Lopes Foundation. “Having the release party was a way of paying tribute to Lisa and showing that we appreciate everything she has given us, the fans and the industry. Even though Lisa has moved on, her Legacy will be with us forever, through her music and the work of the Lisa Lopes Foundation,” stated Ronald Lopes, brother of Lisa “Left Eye” Lopes. 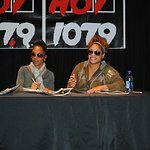 With the assistance of the celebrities, The People’s Station V-103 FM, Sponsors and guests in attendance, the event was a successful fundraiser benefiting the Lisa Lopes Foundation and the orphanage in Honduras, Hogar De Amor (Lisa’s Home of Love). For more info about the Lisa “Left Eye” Lopes Foundation, contact Tafia L. Allah-Pringle, Publicist at (973) 902.6749 or tafia@tlapr.com or visit www.lisalopesfoundation.org.